The feat of Dominican archaeologist Kathleen Martinez, which has circled the globe with her project “In search of Cleopatra’s tomb,” continues attracting the attention of the world’s scientific community. And that’s the reason the scientist of Chinese origin Ng Tze-Chuen, known for his successful projects at NASA and the Russian Astronomy Center, will visit Dominican Republic for the first time. Ng Tze-Chuen will spend two days on Dominican soil, during which he’ll define the needs which Dr. Martinez’s exploration has its final phase of the search of the tomb of Cleopatra, the last queen of the Nile. The scientist has sought to contribute by volunteering his knowledge to the project, noting its extreme importance for universal archaeology, as a result of the publication by National Geographic Magazine on the work carried out by the Dominican archaeologist. After his visit Ng Tze-Chuen will travel to Hong Kong to work in the design of a high tech robotic device that allows easier and more accurate access to the entangled Egyptian ruins. During his stay in the country he’s scheduled to visit Foreign Relations minister Carlos Morales Troncoso and Santo Domingo Catholic University director, reverend Ramon Alonso Beato. “Ng Tze-Chuen and I are joined by common things, he’s a dentist dedicated to the invention of robots and research devices and I’m a lawyer with a passion for archaeology. Both of us are chasing our dreams,” said Martinez after revealing that it’s the first time that a scientific personality of such importance comes to Dominican Republic. via Dominican archaeologist continues attracting glances of the world’s scientific community | DominicanToday. Russian Prime Minister Vladimir Putin traveled to the Taman Peninsula on Wednesday to perform yet another of his trademark adventure activities and scuba dive at a site known as the Russian Atlantis. Putin is making the dive to publicize archeological restoration work on the submerged part of the ancient Greek city of Phanagoria . “By scale and value, this monument can be compared to a rich oil deposit. Archeology is not measured in money but Phanagoria’s ‘capitalization’ is simply astronomical,” archeological expedition head Vladimir Kuznetsov said. The Phanagoria project is funded by the Russian Geographical Society, led by Emergencies Minister Sergei Shoigu and closely linked to the ruling United Russia party. Putin met with archeologists working in a field camp and is expected to dive to the bottom of the Taman Bay, in the Kerch Strait. Putin was shown around the excavation site, starting with the Boyur Gora man-made mound dating back to the 4th century BC. The mound is 10-11 meters high and about 100 meters in diameter. “It is a unique architectural structure – an earth building,” Kuznetsov said. Putin picked up a fragment of a handle from an ancient amphora. “Can I take it?” he asked the archeologists. “It might be useful in my household,” he added smiling. 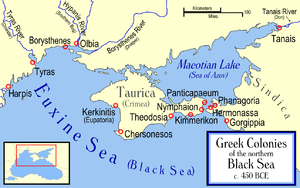 Phanagoria was once the largest Greek colony on the Taman Peninsula, spreading on two plateaus along the Asian shore of the Cimmerian Bosporus. The location of Phanagoria was determined in the 18th century, when marble statue bases with dedications to Aphrodite were discovered there. Among the recent finds is an inscription indicating that a synagogue existed in Phanagoria as early as 51 AD. The dive is the latest in a string of well-publicized adventurous activities by Putin, including flying warplanes, taking submarine dives, helping to put out fires in a firefighting aircraft, and tagging tigers. via Putin prepares dive to ‘Russian Atlantis’ | Russia | RIA Novosti. Phanagoria was founded ca. 543 BC by the Teian colonists who had to flee Asia Minor in consequence of their conflict with Cyrus the Great. The city took its name after one of these colonists, Phanagoras. “The unusual nature of the Taman peninsula near Phanagoria, with its ravines, crevices, hills, and low cones of active volcanoes, must have impressed the ancient colonists even more than it impresses us today”, Ustinova has observed. In the 5th century BC, the town thrived on the trade with the Scythians and Sindi. Located on an island in the ancient archipelago of Corocondamitis, between the Black Sea and the Palus Maeotis, Phanagoria covered the area of 75 hectares (185.3 ac), of which a third part has been subsequently submerged by the sea. In the early 4th century BC the burgeoning Bosporan Kingdom subjugated much of Sindica, including the independent polis of Phanagoria. The town’s importance increased with the decline of the old capital, Panticapaeum, situated on the opposite shore of the Bosporus. By the first centuries AD, Phanagoria had emerged as the main centre of the kingdom. During the Mithridatic Wars, the town allied with the Roman Republic and withstood a siege by the army of Pharnaces II of Pontus. It was at Phanagoria that the insurrection broke out against Mithridates VI of Pontus, shortly before his death; and his sons, who held the citadel, were obliged to surrender to the insurgents. An inscription found during excavations testifies that Queen Dynamis honored Augustus as “the emperor, Caesar, son of god, the god Augustus, the overseer of every land and sea”. The loyalty to Rome allowed Phanagoria to maintain a dominant position in the region until the 4th century, when it was sacked and destroyed by the invading Huns. Russia’s hard man Prime Minister Vladimir Putin pulled on a wetsuit Wednesday and went scuba diving at an ancient Greek Black Sea site in the latest populist stunt preceding next year’s elections. State news reports said he descended just two metres (6.6 feet) and “luckily” discovered two sixth century urns in full presence of the media, because the water was so clear. “Treasure!” a dripping wet Putin told reporters with a big grin. “They drank it all already,” he added when asked if there was anything left in the jars. Putin — a novice only attempting his third scuba dive — “came across” the objects during an expedition on the southern Russian coast near Ukraine. “The head of the expedition said they are from the sixth century AD,” Putin said with a diving mask imprint still clear on his face. This would date them to the time of the early Byzantine era. “When the ships were being loaded at the port, the jars would often break and then they would get tossed overboard,” Russia’s de facto leader explained. Footage showed Putin accompanied on the diving raft by Russia’s emergencies minister Sergei Shoigu and the powerful metals tycoon Oleg Deripaska. The Basic Element company chief reportedly told Putin that he forgot his diving suit and refused to go into the water. A fake bomb caused police to evacuate hundreds of tourists on Sunday from the Colosseum, Rome’s most famous monument. The alarm was raised by a tourist who spotted the wires emerging from a metal can and thought they were part of a detonating device. Police evacuated the first-century amphitheatre after receiving an anonymous threat by phone. Authorities said as a precaution police destroyed the can, which contained the paint diluent turpentine and a nine volt battery connected to two electrical wires. Police said the device was harmless and could not explode or burst into flames. The incident caused Rome’s mayor, Gianni Alemanno to return to Rome from a mountain break in the central Abruzzi region. He described the fake bomb as a “a joke, in exceedingly bad taste, or the work of a madman”. The package was placed in an area where there is no public access, an arcade of the world-famous monument, in a manner that could give the impression that it was a bomb. via Italy: Tourists evacuated as Colosseum hit by bomb scare | Adnkronos.